The Townhouse07718144246work Self-cateringSituated less than a 2 minute walk from York Minster and the Treasurer's House in the heart of the historic Minster Quarter, this spacious Victorian Townhouse provides over 1500 square feet of space for you to enjoy your holiday in style and comfort in this peaceful yet central location - just a few minutes’ walk from some of the best restaurants, pubs and eateries that York has to offer, as well as its bustling shops. 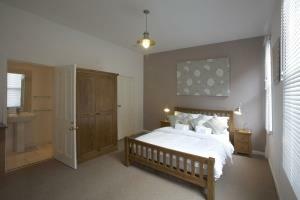 The Townhouse has two King size bedded rooms, and one large twin room. It has a family bathroom, en suite and two further WCs. The ground floor has a very spacious living room including a sofa bed for occasional sleeping. There is a separate dining room, a well equipped kitchen and a garden. The lounge and bedrooms all have their own television and music systems. Towels, linen, toiletries, tea and coffee, are provided for your stay. We also provide a cot for babies on request. Visit our website for floor plans and details room by room and parking Information.